Six weeks after receiving a groundbreaking procedure performed by a University of Florida veterinarian to correct a rare eye abnormality, an endangered okapi calf is recuperating well at White Oak Conservation Foundation in Yulee, Florida. 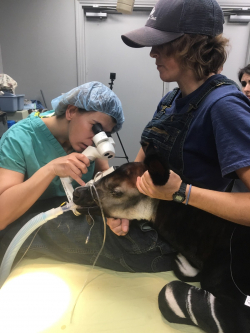 Caryn Plummer, D.V.M., an associate professor of ophthalmology at the UF College of Veterinary Medicine, served as the primary surgeon, collaborating with White Oak veterinarians in the procedure, called a keratectomy. It was the first ever reported to be performed in the species. “Mom and calf are doing great,” said Kyle Donnelly, D.V.M., a third-year zoological medicine resident at the college who, through a decades long collaborative relationship between UF and the center, also serves as White Oak’s resident veterinarian. The arrangement provides additional training to UF zoological medicine residents while supplementing the strength of the center’s on-site veterinary medical team. “Her eye is expected to have only a small scar, once fully healed,” Donnelly said. The calf had a condition known as a dermoid, a congenital lesion where normal tissue appears in an abnormal location, Plummer said. The okapi are part of White Oak’s conservation breeding program, the largest of its kind in the world, with 17 okapi — including the new baby — residing at the center. The calf’s name is Maziwa, which is Swahili for milk. 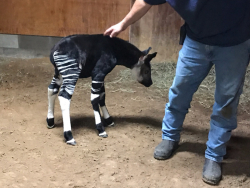 Donnelly said the center’s okapi keepers saw the abnormality shortly after birth, and the animal was taken to surgery 15 days later, on Dec. 19. That period of time allowed White Oak to coordinate with Plummer to perform the procedure and for the team to separate the okapi baby from its mother — a sensitive undertaking for several reasons. “We are lucky at White Oak because our team has worked with this unique species for so long, the keeper staff is acutely aware of how tricky removing a calf and then successfully reintroducing her to the dam can be,” Donnelly said, adding that the risks of separating the two include maternal rejection and potentially even harm to the calf. “Our priority was to save the eye and keep the two together, which would give the calf the best chance at life,” she said. Keepers began separating the pair for short periods, then gradually working up to the estimated length of the calf’s procedure. “Once the big day arrived, the dam remained calm while the calf was separated and reintroduction was smooth,” Donnelly added. A large group participated in the procedure, including Plummer as primary surgeon, Donnelly, White Oak veterinarians Scott Citino, D.V.M., and Jessica Emerson, D.V.M., and second-year UF zoological medicine resident Jane Christman, who drove to White Oak with Plummer to scrub in. Plummer said there is usually some way to address a dermoid surgically, through removal, excision and reconstruction. Where the condition is present determines the type of surgery performed, she added. Had the procedure not been performed, the calf would have suffered from the discomfort of having the feeling of hairs in her eyes all the time and probably would have had scar tissue that could have led to blindness. White Oak Conservation, which is owned by philanthropists Mark and Kimbra Walter, works to save endangered species and wild places, leading global conservation through innovative science, education, training and collaborations, said Brandon Speeg, the organization’s director of conservation. White Oak is located on 17,000 acres of quiet forest in the northeast corner of Florida, about an hour north of Jacksonville.